Indiana Landmarks saves the places that matter to Hoosiers—houses, barns, bridges, churches, schools, downtown districts, vintage neighborhoods. By restoring and repurposing historic buildings, we reconnect people to heritage and revitalize communities. We save buildings because they stir us. They’re inspiring examples of Hoosier art and spirit, ingenuity and craft. They heighten our sense of place and connect us through the generations. They help us remember what’s important in our lives. We save buildings people will use and enjoy today, adapting vintage places rather than throwing them away, to keep connections to the past and to spare the landfills. We believe that, like hard work and hospitality, revitalization is a real Hoosier value. We save buildings because restored landmarks are economic drivers. They improve property values, promote tourism, and inject vitality into neighborhoods and business districts. They create and support local jobs. Their distinctiveness attracts the workforce of the future. Perhaps most importantly, we save buildings because they’re the places that draw us in and hold us fast. They’re the buildings among which we live, work, explore, and pass on what we’ve learned. Saving places. It’s our passion and our purpose. If it matters to you and your community, it matters to Indiana Landmarks. Field services: Our regional office staff can offer resources, advice, and support. Founded in 1960, Indiana Landmarks is proud of our status as the largest statewide preservation organization in the U.S. because it means that people here value historic places and that we are darn good at what we do. In 1960, Hoosier civic and business leaders founded Historic Landmarks Foundation of Indiana, renamed Indiana Landmarks in 2010, to preserve significant sites for the benefit of present and future generations. The inaugural co-chairmen—Eli Lilly and Herman Krannert—ensured a promising degree of respect and clout. Indiana Landmarks’ first project, the restoration of the Second Empire-style Morris-Butler House in Indianapolis, also served the broader purpose of revitalizing a run-down area. Later known as the Old Northside, it’s one of many neighborhoods we’ve revitalized as historic districts in Indianapolis and elsewhere. 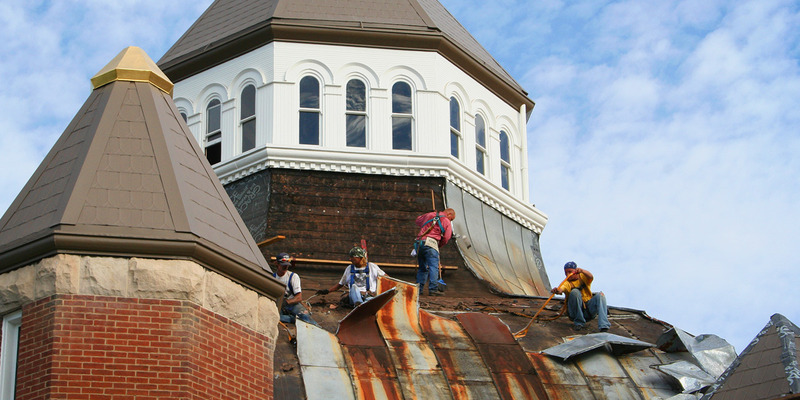 By the mid-1970s, Indiana Landmarks had expanded programs and outreach, establishing innovative real estate programs to rescue endangered properties and use landmarks as the basis for community revitalization. We’ve sparked the creation of local non-profit preservation organizations, providing crucial financial, strategic, and staff support at key moments. Indiana Landmarks’ commitment to empowering local leadership can be seen in the 62 local organizations formally affiliated with Indiana Landmarks and nearly 50 local preservation commissions in our state. We also developed educational programs, workshops, tours, awards, a magazine, e-letters and social media networks to increase Hoosiers’ awareness of landmarks and the importance of stewardship and preservation. A private organization not affiliated with government, Indiana Landmarks grew from an all-volunteer force to a membership-based nonprofit with professional staff in an Indianapolis headquarters and nine regional offices who help Hoosiers save and repurpose old buildings and revitalize neighborhoods and downtowns.